The Road Map Project is announcing its endorsement of the King County Best Starts for Kids levy proposal. 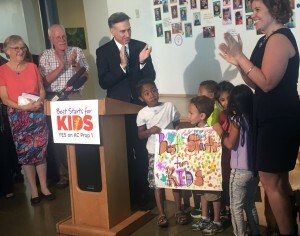 King County Executive Dow Constantine kicks off the Best Starts for Kids levy campaign on Aug. 6, 2015, with help from children. The Road Map Project is a collective impact initiative working to dramatically improve education results in South Seattle and South King County, the county’s areas of greatest need. The Road Map Project’s goal is to double the number of students who are on track to graduate from college or earn a career credential by 2020, and to close opportunity gaps. Recent data show the need in our region is growing; students and families are facing increasing rates of poverty and homelessness. Best Starts for Kids will invest early in children’s lives, with strategies focused on young children and pregnant women, then use prevention efforts to sustain those gains. Equity is a core principle of Best Starts for Kids, a commitment shared by the Road Map Project. The Road Map Project applauds King County Executive Dow Constantine and the Metropolitan King County Council for their leadership on this historic ballot measure. “Children succeed when they have a chance for a best start, regardless of their circumstances. This levy will support kids’ success in school and their social emotional development — from cradle through college and career,” said Mike Heinisch, Executive Director of Kent Youth and Family Services and Board President for the Community Center for Education Results, the nonprofit organization supporting the Road Map Project. Best Starts for Kids is an initiative to improve the health and well-being of King County residents by investing in prevention and early intervention for children, youth, families and community. Most of the revenue would be invested in strategies focused on children under age 5 and pregnant women. Other levy-funded supports would include strategies focused on children and youth aged 5 through 24; strategies to create safe and healthy communities; the creation of a youth and family homelessness prevention initiative; and evaluation, data collection and improvement of the delivery of services and programs for children and youth. The levy will appear on the Nov. 3 ballot.